Gerald Ridenour, an Aviation Cadet in the U.S. Army Air Force, died in World War II. He was just shy of his 21st birthday. 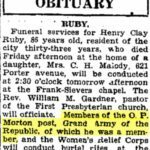 When my mom showed me his grave at Highland Cemetery in Perry County, Ohio, I knew I had to find out more about him. I found him listed on the WWII Army and Army Air Force Casualty List on Fold3. The information includes name, serial number, rank, and something pertaining to the death. From World War II Honor List of Dead and Missing: State of Ohio. Online at Fold3 (titled WWII Army and Army Air Force Casualty List). It was when I looked for the meaning of “DNB” (Died Non-Battle) that I discovered there is meaning in the serial number, also referred to as a service number. The U.S. Army began issuing serial numbers to help avoid mixing the records of people with the same name. (A genealogist’s dream come true!) When we dig a little deeper into the number itself, we can learn a bit about the person. Some prefixes were used in World War I. 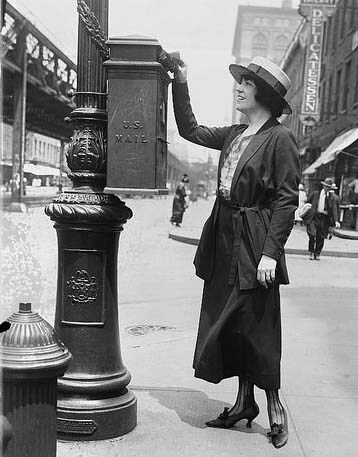 However, the following system began shortly before World War II. The first character gives us a lot of information. William Petruzzi was a commissioned officer. (We also knew that from him being listed as a 2 Lt. But if his rank hadn’t been listed, we would have discovered he was a commissioned officer based on his serial number. Since the second digit of Gerald Ridenour’s serial number is 5, we now know that he enlisted from either Indiana, Kentucky, Ohio, or West Virginia. The same for where Robert Pratt and William Ratliff were drafted. Arthur Porter, from the National Guard, also enlisted from one of those four states, since the third number of his serial number is 5. “US Army WWII Dog Tags” by Alain Batens on World War II Living History & Reenacting Information has great info about different styles of WWII dog tags and how to decipher them. 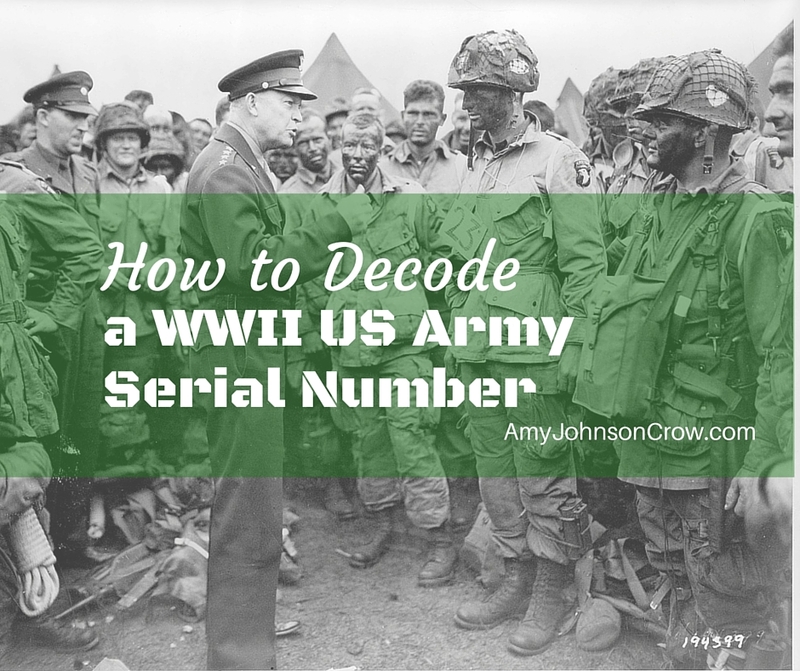 The US Army Serial Number Generator at Hero Files will generate an accurate WWII-era Army serial number based on the criteria you enter. Useful for authors and reenactors. War Department, World War II Honor List of Dead and Missing: State of Ohio, (Washington, DC: by the War Dept., June 1946), p. ii. Available on Fold3. “Service number (United States Army)” on Wikipedia. “US Army WWII Dog Tags” by Alain Batens on World War II Living History & Reenacting Information. This entry was posted in Military, World War II by Amy Johnson Crow. Bookmark the permalink. This applies only to USA forces. Its heading should indicate this. There are family historians and WW 2 forces in many other countries !! You’re exactly right, Ian. I have edited the title and the heading to better reflect that. My apologies for any confusion. I have my grandfathers serial number and a record where he enlisted, but how can I find more about him? i.e., Where was he stationed, last known address, or other family members? After enlisting he became a ghost, my mother was born at the army hospital there but there is no record of that either. She did not know him and has been desperate to learn more! Maybe she has siblings! Hi, Lacey! Glad you got at least some info from the post! Was this during WWII? Was the post in the US or overseas? If overseas, I think there’s a record group at the National Archives for births of American citizens abroad. Have you looked for your grandfather in the 1940 census? The reason I ask is if you find him there (hopefully still living at home), you might be able to track some of those people forward and see if he’s mentioned in any of their obituaries (which could give you another point in time for him, possibly even a location). Does your mother know what unit he belonged to? If so, look for reunion groups; many of them have message boards. Your mother could also do a DNA test to find some genetic relatives. It’s amazing what those tests can do in situations like this. Good luck! have you tried the Military records archive in St. Louis. MO.? They lost a lot of records in a fire in 1976 but still have a lot. I got my father’s & his brothers full Army & Marine records from WW2. Also if you know the town he lived in you could see if they have a VFW there. They may have info too. They also have WW1 records, don’t know about any of the other wars. I got my fathers Navy records dating back to 1902 from here. You can submit the info online and when they find how pages it is they will send you the cost which you have pay before they send the copies. I does take time but well worth it. Can someone help me, please? I found an old draft registration card on my great great grandfather. It shows a letter U before a 3 digit serial number of 709, this was in 1942 but I have only the year not month or day. I’ve been trying to search for more information but I have no idea where I should even start looking. The 1942 draft (AKA “the old man draft”) wasn’t a draft in the traditional sense. According to the National Archives, “This draft registration was not intended to be used for military service, but to provide a complete inventory of manpower resources in the United States that could be used for national service.” The serial number listed on these cards don’t indicate military service. My understanding is that the numbers on those cards have no intrinsic meaning, and were just a way to number the men who were listed. Thank you! Thanks to this I got to be able to read my grandpa and great uncle’s army serial numbers : ) I really appreciate this. They never talked about WW2 much around me since I was too little at the time and by the time I was old enough…they were gone so I’m trying my best to learn about them during that time. Quite an interesting posts. I can so envision you walking with your mom and she remembering the memories. The info on the serial number is new to me, so I quickly looked up my uncles and can know for sure he was drafted. You listed about the first two numbers, but does the other numbers signify anything also? I’ll be adding this into his story. To my knowledge, the rest of the serial number is “just” a number. Thanks Amy! Does this apply to just Army or Navy too? These are just for the Army. Good to know – my father was Navy, I’ll search on if there is a decipher Thanks for bringing this topic up! researching family of a ww2 soldier. he has a 7 digit number. in the military list of casulties, only a few have 7 digits while most have 8. Help please. Can you tell me a bit more about him? I’d like to look into this. That’s a great tip. Thanks! A German crash site team recently found some aircraft parts and a Dr.’s ID bracelet near Aachen, Germany. It only says “Dr Franklin L. Wilson, O-486705”. I can’t find anything about him online, and he’s not listed as buried overseas on ABMC.org’s website. Can we tell where he was from using any of the numbers? I can then research WW2 deaths by state. They’d like to give it to him or his relatives. Thanks. As far as I can tell, the 6-digit commissioned officer numbers (which is what the O prefix indicates) doesn’t tell the Army Area or Corps Area, which would narrow down where he was from. He isn’t listed in the Rosters of World War II Dead, 1939-1945 on Ancestry. Is it possible that Dr. Wilson didn’t die in the crash? If so, could he be the Franklin L. Wilson who is buried at Arlington National Cemetery? He was a Lt. Col. and served in both WWII and Korea. That would be consistent with your Dr. Wilson being a commissioned officer. The Col you are referring to was a 1951 West Point Graduate how could he have served in WWII? I think this is a FOIA request, as the item recovered with this Officers ASN was from a WWII Aircraft Crash Site. And the Silver Bracelet of WWII style. Thanks, Nan, but I don’t have a book on the topic. Just this blog post. I have part of my father in laws parachute from WW2. the only numbers on it are 0-AC-42-48866. Is there any way to get information on it? I’ve got a watch that’s inscribed on the back Wm S. Davis O-1166953. Is there anywhere I can find additional information on the service number? I’d like to reunite his family with the watch if possible. Thanks. My father was stationed in Iceland in WW!!. I have his serial number, how can I find out what troop or unit he was with and where in Iceland he was stationed? Hi, Deana! That’s cool that your dad was in Iceland! (Yes, the pun was intended 😉 ) Do you know where he was living when he came out of the service? When he was discharged, he should have filed his separation papers at the county courthouse. Those papers would list his unit. Do you have any papers related to a pension or anything regarding the VA? Those often include information like that. My great uncle died in France during WWII. I have his service number but can’t really find anything else on his death. I would really like to know the location where he died. Any ideas? My father enlisted in 1956 or 57 under the federal reserve act of 1955. He was given a serial number fr19556887. he was sent to Fort Ord then to Fort Chaffee. He has lost his dd-214 and we have tried everywhere to replace it but none of the sites recognize his serial number. Is this a true serial number ? and where can we go to get his records? That is a great question — and one that I wish I knew the answer to. My suggestion would be to contact your county or state veterans affairs office and see if they can guide you. If your father is trying to get benefits, they likely have a counselor or ombudsman who can guide him through the process since he doesn’t have his DD214. FR indicates a reserve officer, using a system adopted after WW2 and Korea. In the late 1960s, the serial numbers were replaced with the Social Security Number. Thanks for that information, Jim! I have a helmet from WWll with the name R. Ms Daniel (no clue why there’s an “s” after the “M”, but its written on 2 places on the head band), service number 45018435. I’d like to get some info the soldier who wore it. I know he enlisted in Indiana, Kentucky, Ohio or West virginia. If you can email me with any info, I’d sure appreciate it. The NARA database list the serial number to a Raymond M McDaniel, from Madison County, enlisted 7-31, 1945 at Indianapolis. Born 1926, Indiana native. Hope this helps. I know most everyone here appears to be discussing WWII but I have recently come across what I know as “dog tags” with a 7 digit number but also my grandfather’s name printed on the opposite side. Based on my grandfathers age he would have had to have been WWI. Could these be “dog tag”? If so is there a way I can get info on the number on the tag? Thank you for any help or advise. Hi Amy. My Great Uncle recently passed away and I’m trying to do a WWII trace of his travels. His serial number is 31229854. I know he was a private, a radio operator and served in the 3rd Army. That is about all. What are options to find out more? Thanks. Hi Doug. There are records you can obtain to learn more about his service. If you have a unit it, it is easier to locate information if his OMPF (service file) burned. You can learn more about research on my website http://wwiirwc.com and I do take clients if you need help. My book on research is listed at the end of the article too. This was extremely helpful, and I do mean extremely. Thank you so much for writing this. Do you have an information as to where I can find serial number information like this for outside of the Us during WW2? Specifically Germany, but any information would be helpful. Thank you. Hi, Debbie. I’m glad you found this post useful! I don’t have any information on how other countries set up their ID numbers. I would suggest contacting the national archives in the country you’re interested in and see if they can point you in the right direction. Good luck! hi – my dad was a WWII US Marine. he was born January 1914 (sorry I could never remember the date) in Detroit MI. he died in January 1998. Again I cannot remember the date. He lived in Saginaw, MI when he enlisted in the Marines in 1943. As for me, I joined the California Natl. Guard in 1956, while in high school, then joined the US Army in Sept. 1956 after graduating from high school. My serial number was RA28xxxxxx (not sure if I am supposed to show it). tried to find info about dad but could not. Are you trying to find more about his military service? You might want to start with the Library of Michigan in Lansing. They have an extensive collection of military records of people from Michigan. Their website is http://seekingmichigan.org/ , which has links to their catalog and their contact information. I am trying to find my adopted Dads serial number. I found it online the other night but now I cant seem to find it. Can you please help me? During WW2. The military has no files on him. His name is Frank F. Iron Shooter, serial number 16015805 and I have no clue what to do next. Thank you. What are you hoping to find? That will help determine what you do next. Amy, in regards to my uncle Frank I.S., while my mom was alive (she just passed at age 96 in March), we spoke of me trying to get him a military headstone. I cannot locate a dd214 because he had passed away in a house fire at home. Apparently his records were also in the fire in Missouri back when. I checked everywhere however seems like no one has any records on him. Even the big veterans records center say they can’t find any information on him. They say if I find something to let them know. So I am still looking. Thank you but if you have any helpful information I sure would appreciate it. He should have filed a copy of his DD214 at the courthouse in the county where he lived when he was discharged. Have you contacted the veteran affairs office in that county? They might be able to point you in the right direction. Yes I contacted the courthouse where he lived and also several local veterans offices. The genealogy place that he’s buried at has a copy of his serial number and that he enlisted in the army however that was decades ago and the new people don’t know anything about the source. I wrote to Missouri and they said just keep looking. …. Also maybe he was not in the military? Or maybe he got discharged… My mom thought he was in the Coast Guard, but her memory was kind of poor. His adult children don’t even know… So there is a Twist to the story somewhere …..thanks! I am doing some research on my granduncle, George Donovan who fought for the US in the Pacific during WWII. I came across your site and was delighted to find out that there was an explanation to his Army Serial Number. You explained the first two numbers but was there a method for the other six or were they just a random selection? George’s Army Serial Number was 32443804 – meaning he was drafted (not enlisted) in New York?? Would it then be right to say he was conscripted or is being drafted / inducted different to conscription? I believe the term would be drafted. I don’t think there is a difference, technically, but I’ve never heard “conscripted” used in WWII records. 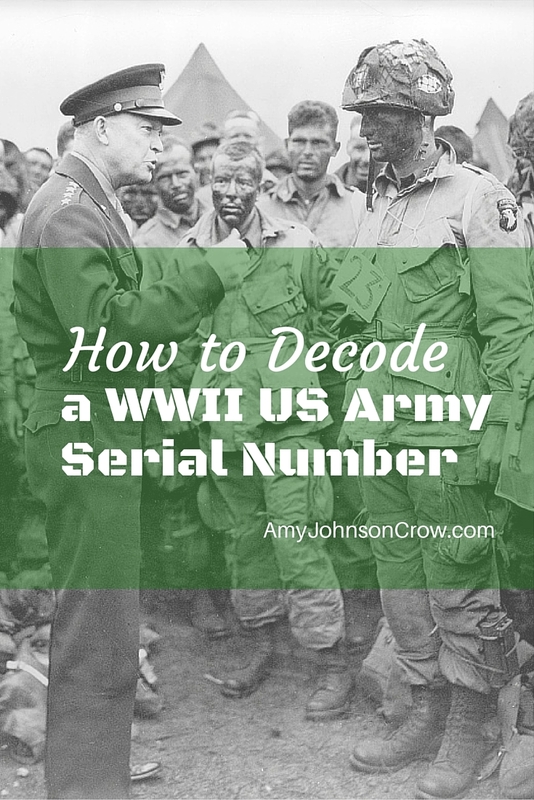 I have several relatives who enlisted in the Army during WW2 and according to this serial number breakdown they were drafted (3)… that cannot be because they lied about their age in order to join. Even a couple of old timers from the VFW have (3) as a first number and I know for a fact they enlisted. I would double check that coding information. Thanks for you comment, Duke. This information came directly from the War Department’s publication “World War II Honor List of Dead and Missing” (June 1946), available on Fold3. Here is the part referring to the number 3: . I don’t know why they would have a number that begins with 3 if they enlisted, rather than were drafted. Something is off with your military serial number decoding. My father retired from the USAF in 1961 as a major. His name was Wilson Reid Lowther and his serial number was AO 860517. If you do a search on the web, you can find his name and this serial number I memorized as a youth, and his name on the USAF retirement rolls. According to your article, he would have been a member of the WAC! So the question is, why the discrepancy? The numbering system noted here was specifically for the US Army, not the Air Force. Also, I do not know how long after the war this system stayed in place. hi – my grandfather was in the Army (823rd tank destroyer battalion), i have his dog tag with serial number 01824704 however I can’t seem to find any information on him in any online search. I see above that those that started with a 0 might have enlisted prior to WWII, but to my knowledge that was not the case with him. Any guidance would be appreciated! additionally, does your serial number ever change? He was promoted to 1st Lt., and eventually Captain, could that be why I am struggling to track any information down? I wish I could find some information about a WWII helmet I took possession of recently. There is more history to the purchase but I would hope to find information so I can figure everything out. It has a name inside “Dennis FW” with a number 14289011. Any help at all would be great. I really appreciate it. Thank you. Hello – My Uncle enlisted in WW2 in January of 1943– I have found what could be his enlistment record and it notes his Army serial number as 11072989. Would his serial number have changed if he entered the Air Corps (then part of the army) and became an officer? Later in the war he listed as a witness on a missing air crew report and his serial number is noted as O-815234. Thanks in advance for any light you can shed on this mystery! Yes. When an Enlisted man is commissioned he receives a new serial number. Those numbers are on the request for monument. Yes he served as 1st Lt. 336 Fighter Sqd. 4th Fighter Group. I have his enlisted paper and request for monument a few pictures but can not find anything else. He served in the Air Corp. James Marshall Hall. Any help would greatly be appreciated. DOB: 28 July 1924. Thank you so much for your assistance. One paper has only 0 -2068660. Very confusing. I suspect that the original number is O-2068660. In which case, the O (letter O,not a zero) denotes that he was a male commissioned officer and the 2 denotes that he enlisted or was drafted from Delaware, New Jersey, or New York. The draft is going to be based on where they registered, which may or may not be the same as where they were born. The number in the serial number just groups states together; it doesn’t have any bearing on birthplace. Hi, Chanetta. Just a little info on The 336th, they were SAC (Strategic Air Command) and the 4th was TAC (Tactical Air Command). Seymour Johnson AFB, NC. I was stationed there in the late 1980’s. Here’s a little info on the O and AO for some. AO	Army & Air Force	Prefix	First used by the Army Air Corps to denote Regular Army officers who were qualified in aviation. Later used by the Army Air Forces (and eventually the Air Force Reserve) to denote reserve officers. O	Army	Prefix	Originally used by Regular Army officers prior to World War II. Hey there, I are across my Grandfathers ASN but can’t seem to find him anywhere online. Would you be able to help at all. I know he was part of the United States Army Air Corps and his ASN is 16032820. Name: Walter Thomas McGee. Please any information would help us. Thank you! When you say you can’t find him anywhere online, what is it you’re trying to find? hi amy, i am trying to find out information about the service of my grandfather in ww2. i know he was at monte casino, anzio, and north africa. he received a purple heart at anzio. i have his serial number and am interested in finding out what unit he was with. i would like to research them more. can’t find any way on line of connecting his serial number to his company or unit or battalion. thanks for any help you may have and for reading this. You can’t determine the unit from the serial number (though it can be helpful to verify that you have the right person if you do see that information together somewhere). Are there any letters home from when he was in the service? The envelope could have the information. What do seven digit serial numbers starting with 6 or 7 imply? I am looking at a company roster from 1944 which has at least 4 enlisted men with this style of serial number. I wish I had an answer for you. Could they have enlisted before the war? JP – there is no consolidated listing of SS/BSM & PH awardees. Have you requested your grandfather’s personnel records from the National Personnel Records Center (NPRC) in St Louis? Many records were destroyed but some were only damaged. I have reviewed records that were singed and still smelled of fire. Also, there were medical and financial records that were not in St Louis at the time of the fire that have been reassembled there. They provide a lot of info. Also, the unit records of the 823rd TD Bn will be on file at the National Archives facility in College Park, MD. That’s where your grandfather’s General Orders awarding him the SS and BSM would be. They PH orders may be there, but they were usually issued by the hospital where he was treated if his would was serious enough to be evacuated. And finally, your grandfather was a officer. The zero is actually a capital O. Good luck! Bob this is super helpful and I can’t thank you enough for replying to my thread. I will look into the request from the NPRC. My mother, his only child is no longer alive so I will have to request it as his grandchild, hopefully that is not a problem. Do I need to file a separate request with the National Archives facility in College Park? Thank you for this informative post. I am a new new new newbie to genealogy research, and I am running in to some strange happenings with my Scottish Great Grandfather who didn’t pass down any stories about himself so I am literally going off of the ancestry.com info. My question is, I found what might be a WWI draft registration card and a WWII draft registration card, and the serial numbers are different. I see that you said that the numbering system changed, I just want to make sure that I don’t have two different dudes with all the same info except their next of kin and their serial number. Any help would be appreciated. Thanks!! To clarify — draft registration cards do not mean that he served. They only mean that he registered for the draft. To my knowledge, they didn’t go back into the draft cards and fill in any serial numbers if they did enter the service. There is usually enough information to tell if the two cards represent the same man or two different men, and if either one of them is the man you’re looking for. Look at the birth date (year) and place. Where are they registering? (Men registered in the town/county where they lived.) Look at the next of kin; who is it? Is it a parent or a spouse? Compare that information with what you already know about your great-grandfather. Great article, Amy. One thought for you. Is it possible that an alternate meaning for “3” as the first digit in a serial number was the soldier “volunteered for induction”? I don’t know. I’m going by the instructions that were in mentioned in the article. Hello, Amy. You are a godsend! For years I have been trying to find out any ARMY info pertaining to my dad. Can I please give you what I have, hoping you can help me? He was born in North Carolina, and lived there, but his serial number indicates he registered in Virginia. Confusing. His serial number was: 53-065-390..The first digit is a ‘5’, which doesn’t tell me anything, cause there is no number ‘5’, according to your serial number statements. My father was a Corporal in the Military Police, stationed at Camp Rum, Austria… thus, I was born there! He lived in Thaur Nr., 83a while he was stationed in Rum, which I believe is the name of the city. 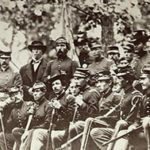 I found a picture of him with his troop, (some kind of formation outside his barracks, I guess) at Camp Rum. US Army Europe, something!. Sorry, too excited to go get those papers now.! On March 25, 1955, he married my mother in Innsbruck, Austria, and also declared I was his daughter, he was the father, etc. , making me a US citizen! To honor him, I need to discover who he was during that time. Please help me if you can…THANKS!!! Hi, Monika. The guide in this post is for the World War II era. I suspect that the Army changed its numbering system by the time your dad joined. One avenue you might want to pursue — if you know where he lived after he left the Army, look in that county for his discharge papers (form DD-214). That could shed more light on his service. Monika – you should request his personnel file from the National Personnel Records Center (NPRC) in St Louis. Many records were damaged and destroyed, but some info may be there. If you google Rum Austria US Army 1954 you will be able to read the command information about duty in Austria in the early 50’s. Viel Glück!